The sound of the violin – how “tinny” or lustrous it is – and the tactile sensation it provides – smoothness or wooden, organic rigidity – also play prominent roles in the quality of a violin, and a novice with an uneducated ear or sense of touch regarding instruments might look over defects in these aspects without second thought. Even one who understands what to watch for but who does not know how to test for them might find difficulty in making a good decision, with no expert, other than the dealer, at hand. The price of a great violin is high, giving much risk to the act of purchasing without a fair amount of information. Buying online poses even more of a danger, as available items are difficult or impossible to try. When a customer new to the purchasing of these instruments is active, he should know what he wants, as suggested by a trained professional or some other trusted source. Of course, many violins and violin companies exist. Even a long-time teacher might be indecisive about which instrument is most suitable for her student. So, to relieve everyone involved of some doubt, this article offers a specific item for beginner usage. 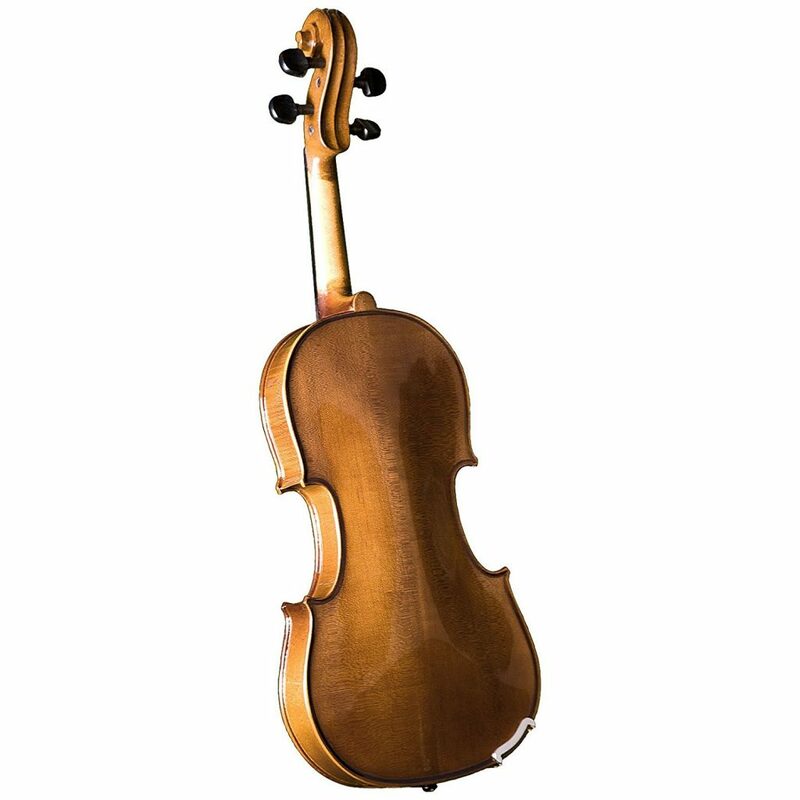 The Cremona SV-175 violin is one whose reviews are, for the most part, exceptional, as they average at about four stars across the web. A high number of reviews accompanies the violin’s listings, providing evidence of the instrument’s renown and frequent usage. The violin is priced at about $200, posing as an excellent purchase for a tester and, since it sits on the high end of the price spectrum, a potentially lasting investment. The violin itself is a dirt-brown color, emanating an authentic and natural presence, and providing a user with a relaxed, unpretentious air. Because of its medium shade of brown, it should sit well in any traditional youth orchestra, and should not stand out amongst a group of wooden musical equipment. Discrimination against the tool would have no basis, and a maestro would view the instrument with good graces. Light gloss adds some protection to the instrument skin, without blocking out the organic appearance that the surface embodies. The sounds that the Cremona SV-175 produces are ones that would be expected from a violin of its color. Brisk and mid-ranged, they can permeate the halls of any symphony center and reach the ears of listeners sitting even in the back row. They provide a warm and crisp sensation, and exhume the same type of energy that a tree might, if strings and a bow were placed on it and in its proximity. They project incredibly well, and can provide fantastic service to even the most critical of ears. Performers should be aware, however, that they lack the fulfilling bass tones that more-expensive instruments provide. Their middle and high frequencies, though, almost completely make up for this, and the missing low end is hardly noticeable. The top of the body is made from the standard spruce wood, while the bottom is comprised of solid maple, another norm in the crafting of violins. The regular-ebony fingerboard, tailpiece, chinrest, and tuning pegs conform to the most rigorous coloration standards, as they reflect light minimally, but, still, somehow, softly glow on the floor of an opera house stage. These tones fit in well with the workings that are present throughout the instrument-making industry, and should not pose an issue in performance settings. The fine tuners are usually bronze in color, and the bridge is a typical light-beige. With the violin comes a bow made from brazilwood, a material that dominates the trade of bow craftsmanship. The bow articulates the finest components of the violin’s sound, and it conjures sweet, warm vibrations from the core of the violin body. With aerodynamically-inclined configurations, it offers streamlined speed and promotes an accurate and precise nature with which the bow can whisk along the string in perfect accordance with the player’s whims and desires. The Cremona SV-175 outfit comes with a variety of equipment to suit any player’s needs and enhance her performance. A protectant, super-portable case that can fit a number of items within is the largest included piece, and it contains a hygrometer, which monitors the humidity of the interior, allowing a user to ensure that his equipment is not being warped by undesirable liquidation or fluid. As mentioned, a bow also is a part of the package. An extra bridge, as the things are fragile and in regular need of repair, is placed amongst the offered items, and Prelude strings by D’Addario are a significant component of the package. A shoulder rest, too, is equipped in the combo. To top it off, shoulder straps for the case are included, providing users with an even easier way to lug the package around. For new students, the Cremona SV-175 violin outfit is a fantastic deal. The quality of the instrument itself, the amount of items that come with the instrument, and the longevity of the entire package are all magnificent for the price at which they are sold. Teachers will be pleased to know that they need not search for the necessary extra equipment of a violinist, and students and parents will enjoy the tone that the violin provides. There is a bundle offer for the Cremona SV-175 – more goodies are included, covering for the entirety of some months’ worth of violin needs (besides sheet music). Rosin is contained here, as are a mute, an instructional DVD, and a better bow. Even finger guides, which can be attached to the fingerboard to help students navigate, come with the pack. This entire combination can be purchased for a little over $305, making another awesome deal from Cremona.